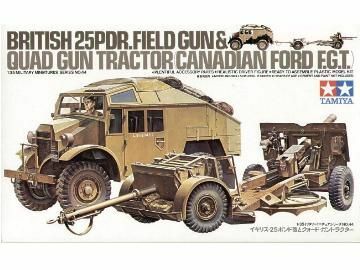 This project started with one of my 10th wedding anniversary presents off my wife Jayne who bought me a British 25PDr Field Gun & Quad Tractor model set produced by Tamiya. Hmmmm I thought to myself what can I do with this? I then remembered that I had the LRDG scene that I had produced and had not been happy with. I had originally intended to place this new kit into a larger re-worked diorama to include all three kits but unfortunately when I investigated this further I realised that the intended diorama would look too cluttered and would not be visually appealing. So after a few pleasant hours trawling the internet to see what other people had done with this kit I originally decided upon having the truck, gun & limber attached to one another in a towing position, being stopped on a desert road with the crew taking time for a cuppa and to have a chat with one of the locals on a camel. 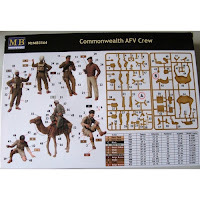 The figures are from the masterbox commonwealth AFV crew set (as seen in the picture below) I have started to use these figure kits a lot in my dioramas as the company depict their figures in more realistic and relaxed poses as opposed to just plain "action" poses that are a little bit contrived for my taste if you see this in every diorama. especially when you consider that most warfare is 90% boredom followed by 10% of shear terror! After quite a lot of consideration and a hiatus of the project for over a year, I decided to re-think my initial idea and split the kits up into two possibly three separate dioramas. This page being amended for the tractor unit dio. First stages of the build and I have to say that I am very impressed with the kit. The quality of the moulding is excellent with very little clean up of flash marks. The detail for such an old kit is excellent and I am now feeling happier for deciding not to buy the etch sets for this kit. So far I have assembled the chassis for the tractor. I have also dry fitted the engine block and differential. Next stages for me are the primer coat for the chassis and to start detailing the engine itself. I am not going to go overboard as I have not decided whether to have the bonnet open or closed for the finished unit but I would much rather have a decently detailed engine that could be displayed if I decide to instead of being forced to keep the engine bay closed because it would be too difficult to detail it after the body has been built around it. After a little research on the Internet for some suitable images of the engine, I realised that for a model manufactured in 1974 it was a very good representation of the actual block. the only real planned additions to this were the producing heads of the spark plugs, the leads and the distributor that is positioned at the front of the actual engine. Another interesting feature is that the leads for each cylinder Bank are fed through a tube which I will also replicate. At this stage I have painted the engine block and head in dark green with the ancillaries in matt black. The leads are hull red with Vallejo black grey for the belt at the front of the engine and orange for the exhaust manifold. Weathering and a dry brush of silver will be added prior to mounting the block in the chassis. Its not the most detailed of engines that I have done but I am happy with the result and would happily display this tractor unit with the bonnet open in a diorama scene. Excuse the dry cracked skin on my hands but I have also been plastering the spare room as well ! ﻿﻿Progress has been a little slow on this build at the moment due to decorating but I have now built up most of the chassis and applied a coat of primer, the seats have been put together and I decided to apply a small amount of Gunz Sango Mr Surfacer to the fabric section of the seats to add a little more depth and wear (see photo). There is also a mounted cable winch on the Chassis which I will add cable to and feed through the rollers on the rear bumper which I have drilled out with a pin vice. I am still in two minds whether have the top hatch open as this would mean scratch building a locking handle for the inner part of the hatch (starting to regret not having the etch set now). I have also filled the casting marks in the doors with Squadron green putty and added the strengthening bars to the door by using a little stretched spru. 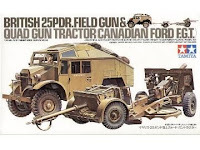 I will also be raiding the spares box for some "clutter" for the interior and exterior of the tractor in the way of weapons, kit bags and tarpaulin. Following painting the chassis in the base colour, I wanted to add the cable to the drum that is provided on the model. For the heavy duty tow cable I opted to use brass picture hanging wire that I purchased as a set from a local DIY store for around £1. It is a perfect scale and pliable enough to form around the drum and to feed through the front rollers incorporated in the rear section of the bumper. Once the cable was wrapped around the drum, it was fixed in place with some cyno to prevent it unwinding and the section of cable sticking out the rear of the bumper was cut to an appropriate length and bent to form a loop. A small amount of Lead foil was then wrapped around the cable to simulate the cable tie clamps seen on the life size vehicle. Following the build up of the chassis and floor section of the tractor I have decided to add some of the usual bits of kit that you would expect to see in a vehicle of this type. After raiding the spares box and positioning them around the cabin its now time for the fiddly painting and addition of straps for the bags, packs and rifles for the cabin, then weathering and wear of the interior before mounting and fixing the cab body to the base. In case I forget to add a picture of this, I will also be weathering and wearing the interior of the cabin section before that is mounted as it would be embarrassing to see a well worn and weather beaten floor but beautifully pristine interior walls and roof inside! finally decided on a title for the dio.